Red Hot Impulse, aka Flashy, is proof that a bit of extra white needn’t bar a horse from being intellegent, able and highly successful! His sire is Implusions, an AQHA World Champion and Congress Champion and also a multiple AQHA, APHA, PHBA World and Congress producing sire. 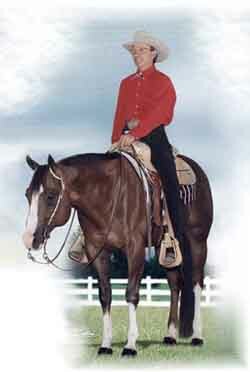 His dam, RD Red Hot Lover (by Red Dee Hobby) is a top producing broodmare, ranked “The #1 Broodmare in the Nation” by Quarter Horse Statistics in 1997! Flashy himself has over 235 lifetime points with limited showing and winnings exceeding $35,000.00. He was in the top ten at the World and Congress 5 years in a row! He is shown here with a few of his foals, many of which are already proving themselves in the showring.